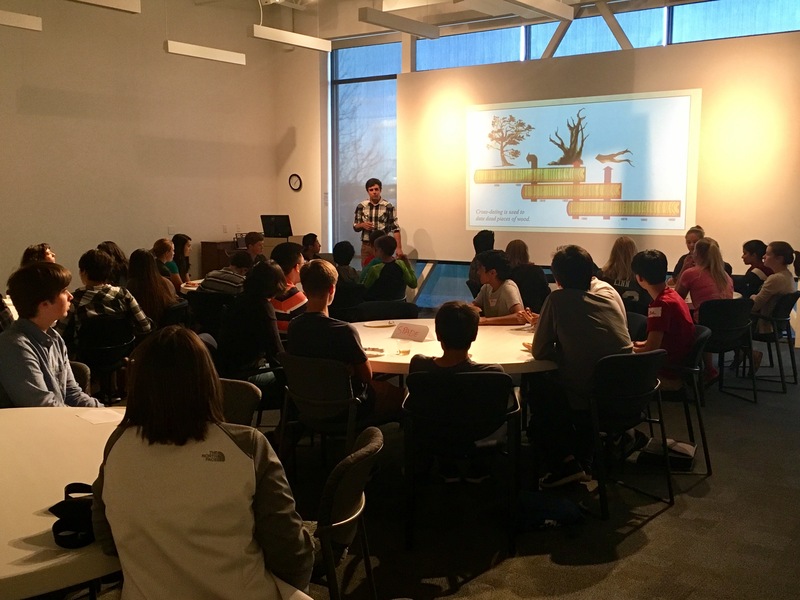 Collin Haffey of the US Geological Survey talks with teens in Los Alamos, NM about the importance of forest conservation. This cafe, Forests in Jeopardy, had two presenters who are experts in the fields of ecology, forestry, and restoration. The first presenter, Collin Haffey, began by introducing the various aspects of the forest in the surrounding area and New Mexico as a whole. Specifically, he talked about how human industrialization, particularly of grazing animals, destroyed the fire cycle that had existed in forests all around north America. Before the 1800’s, brush fires occurred about once every 5-7 years. This was a natural way to clear out dead materials while not causing massive unprecedented destruction. This lack of natural fires resulted in massive extremely hot fires that damage forests and the soil. This process of causing massive fires was helped by the cultural awareness campaign of Smokey Bear. Massive fires such as the Los Conchas fire swept through forests leaving nothing behind but hydrophobic soil. Now firefighters perform controlled burns and other material thinning techniques, but massive fire filled convection cloud forming super fires can still happen. The speaker added to his presentation by sharing various anecdotes involving early forest fires as well as the devastation and restoration of areas damaged by these events. 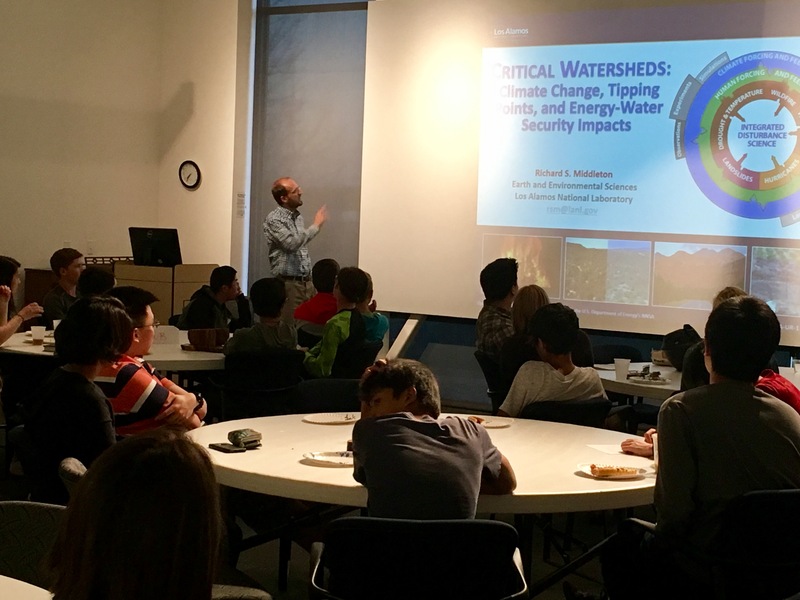 Richard Middleton of the Los Alamos National Laboratory talks about watersheds with local teens. Richard Middleton was the next speaker. He addressed the issues associated with human impacts on the watershed changes in our local areas. Specifically how various disturbances, natural and man-made, influence water source availability. Disturbances such as fire can cause massive flash floods and very little groundwater absorption from the soil. Natural disturbances such pathogens can also cause imbalances in the ecological systems. Climate change and rapid global warming massively affects how water cycles will operate throughout the year. He showed a moving average diagram of predicted impacts on water levels in the Northern New Mexico region for several decades into the future. The diagram showed predictions of 6-11% lower streams year round in the coming years if the current global warming trend continues. He also showed a small visual simulation of a spreading wildfire and is surrounding impacts. That simulation used 3 million CPU hours. He then describes a project where scientists isolated a tree in a massive plastic cylinder so that air content and temperature could be regulated, so as to further test the effects of climate change shown by the various simulations. These descriptions of these complicated processes were greatly assisted by the moving and dynamic simulations. Both speakers then answered audience questions, as well as questions students had written down. Some questions involved how forests can be used as CO2 sequestration systems. The two speakers discussed this topic and how it relates to disturbances in forest ecology causing less CO2 sequestration to occur. Another question was how various bark beetles affect these various systems in the forest ecological systems. The speakers then discussed how many of pathogenic disturbances are balanced out based on tree health, tree density, and other disturbances in the area. Many of these native pathogen disturbances are part of the natural cycle of the forest. The speakers also discussed student questions regarding native versus non-native and invasive species and how that affects forests. Overall, the speakers effectively worked together to communicate interesting information about their fields of expertise pertaining to forestry in hopes to excite high school students in areas of STEM.